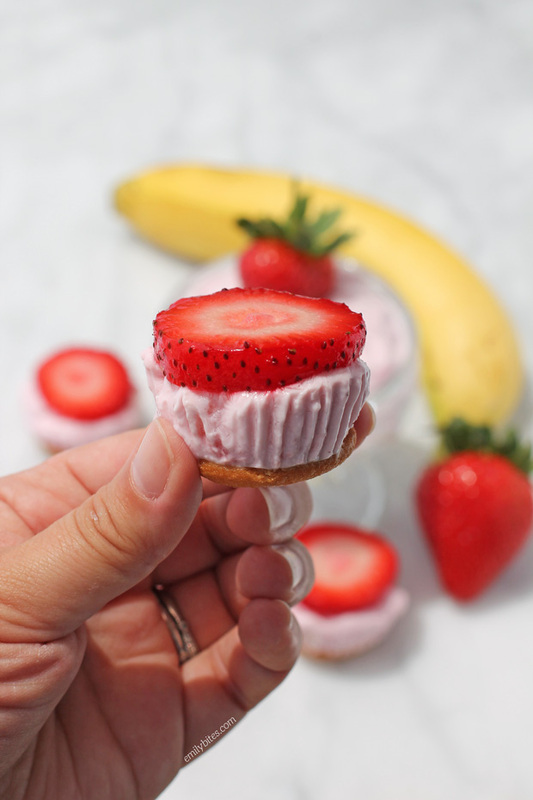 Whether for a snack, dessert or even breakfast, these Strawberry Banana Frozen Yogurt Bites are a perfect lightened up treat to grab from the freezer and savor. 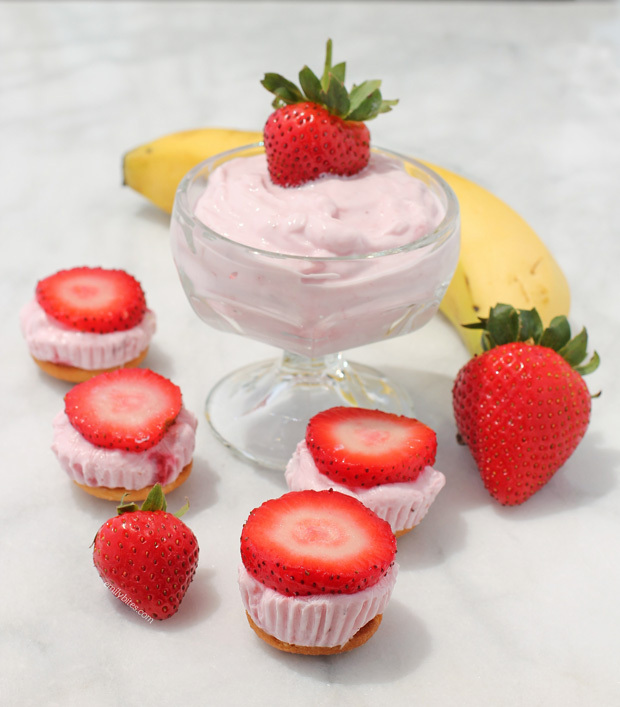 The strawberry and banana flavors taste fresh and Summery and the frozen Greek yogurt is cold and creamy. 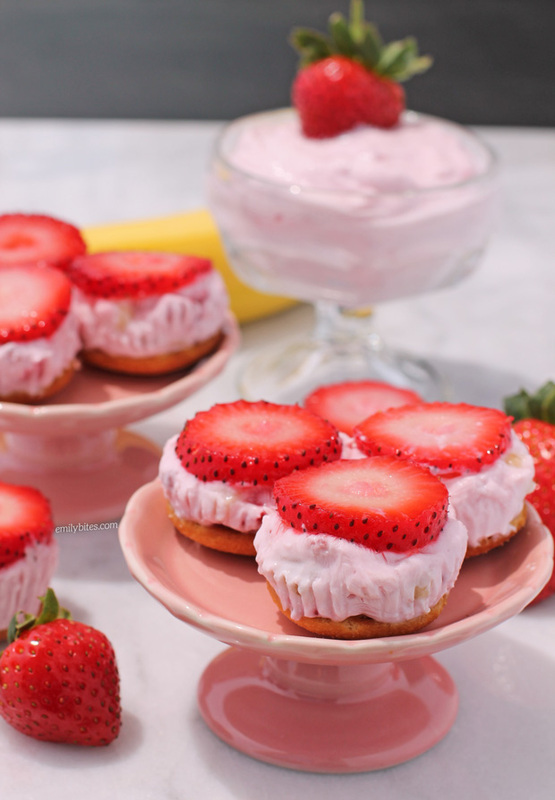 With a vanilla cookie on the bottom, each cup tastes a little like frozen strawberry shortcake – for just 29 calories or 1 Weight Watchers SmartPoint! June is Dairy Month, and when the American Dairy Association and Dairy Council* (ADADC) reached out and asked me to come up with a recipe featuring dairy I couldn’t wait to get started. I love all things milk, yogurt and cheese and I decided to use Greek yogurt because my home state of New York is the top yogurt-producing state in the whole country! Yogurt is even our official state snack. Plus, while dairy is already packed with necessary nutrients (one serving of milk, cheese or yogurt provides 8 grams of high-quality protein and 9 essential nutrients), Greek yogurt typically has twice the amount of protein of regular yogurt. More protein means a more filling, satisfying snack! When you think of New York, many people picture the skyscrapers in NYC, but you may be surprised to learn that New York has over 5,000 dairy farms across the state and is ranked 4th nationally in dairy farming. I live out in Western New York (way on the opposite side of the state from NYC), so several of those are out by me! If you’re curious to learn more about what it’s like to live and work on a dairy farm near where I live, check out this short video featuring Kendra Lamb of Lamb Farms, a dairy farmer just outside of Buffalo, NY who has over 4,200 cows and produces milk used to make yogurt for New York City Schools. 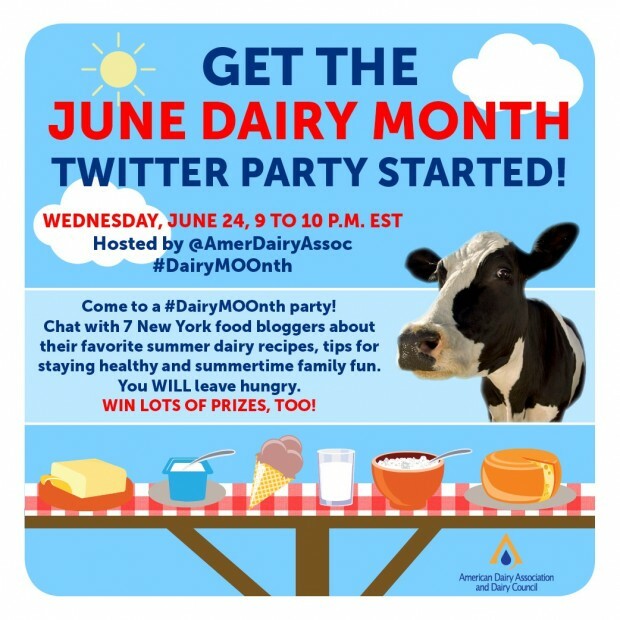 For more dairy facts and delicious recipes from other great New York food bloggers, join in for the ADADC’s June Dairy Month Twitter Party! The party with be Wednesday, June 24th from 9-10 PM and you can come to the party by following @AmerDairyAssoc on Twitter and using the hashtag #DairyMOOnth. There will be prizes! Can’t make the party? Make sure to follow the ADADC on Twitter, Instagram or Facebook for more dairy tips and fun recipes like this one. Want more of my tasty lighter recipes using yogurt? Check out the ‘yogurt’ ingredient tag in my recipe index for ideas like Key Lime Cheesecake Cups, Spinach & Artichoke Dip, Blueberry Pancakes, Raspberry Peach Tea Smoothie, Zucchini Casserole and Chocolate Cherry Baked Oatmeal Singles. I love this sweet and refreshing summer treat! Pinned! What an awesome idea! Hooray for Dairy Month!! These look so good! Plus they are only 1 WW point so they make the perfect sweet (but not too indulgent) treat. Love the strawberry banana combo…yum! What a brilliant sweet treat that’s good for you, too. This would be such a nice little bite post workout, too, between the cool off quotient and the protein! These are such a great idea! I love that they are only 29 calories each so I won’t feel as bad if I eat 10. 🙂 My kiddos would definitely love these too. A fun little afternoon snack.